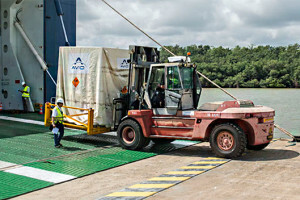 The liquid upper stage for a November flight utilizing Arianespace’s lightweight Vega vehicle has been delivered to French Guiana, supporting the company’s sustained mission pace in 2015 with its complete launcher family at the Spaceport. The AVUM for Arianespace’s Vega mission with Europe’s LISA Pathfinder scientific spacecraft is unloaded from the MN Toucan roll-on/roll-off sea-going cargo ship after docking at the Port of Pariacabo in French Guiana. This upper stage – known as the Attitude and Vernier Upper Module (AVUM) – arrived aboard the MN Toucan, a roll-on/roll-off sea-going cargo ship utilized by Arianespace for transporting launcher components from Europe to South America. The AVUM will help place Europe’s LISA Pathfinder scientific spacecraft on its way to a 500,000 km.-by-800,000 km. halo orbit around the first Sun-Earth Lagrange point (located 1.5 million km. from Earth). Developed by Italy’s Avio, the AVUM is the only liquid propellant system on the four-stage lightweight launcher, and is stacked atop Vega’s solid propellant first, second and third stages. LISA Pathfinder’s goal is to help test and validate the technology in space needed for detecting low-frequency gravitational waves, which are ripples in space-time predicted by Albert Einstein’s theory of general relativity. Test masses carried by the spacecraft will be put in a near-perfect gravitational free-fall, controlled by electrostatic fields. LISA Pathfinder’s onboard sensors and systems will control and measure the masses’ motion with unprecedented accuracy. Vega is the smallest vehicle in Arianespace’s launcher family, which is in operation from French Guiana along with the medium-lift Soyuz and heavy-lift Ariane 5. Production of Vega is the responsibility of industrial prime contractor ELV – a company jointly owned by Avio and the Italian Space Agency.